Well, it’s Memorial Day, and you know what that means—swimsuit season! Those two words are typically enough to evoke panic in the most body confident of girls, but have no fear. Your get-in-shape-in/by-the-pool tips are here! Courtesy of LA Boxing (a chain of boxing, kickboxing and mixed martial arts clubs that Erin tried herself last year), these tips are sure to turn your pool time into firm time. And remember, if you’re not feeling totally A-OK in your suit, remember that fit bottoms come in all shapes and sizes AND, let’s be honest, everyone at the pool is more worried about what they look like than you, so kick back and enjoy the sun! 1. Lift that leg. While sunning yourself poolside, try alternating leg lifts. Hold each leg up for about 10 seconds to tone your thighs and lower abs. 2. Go for a walk. You don’t have to swim to get a good cardio workout in the water. Do laps around (or in) the pool. Burn more calories by using your arms as if you were power walking or carrying free weights. 3. Weight it out. Along with the sunscreen, pack a light weight in your bag to do some arm curls while relaxing in your chair. If you forget the weights, throw a few more ice cubes in your drink for “heavier” sips. 4. Take a dip. 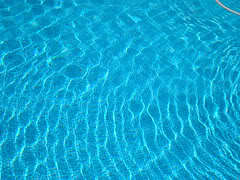 Sit on the edge of the pool on the shallow end and proceed to lower yourself into the pool. After standing in the pool, pull yourself back up to the edge, doing a full tricep dip. Repeat for about 10 counts and feel the burn! 5. Diving board pull-ups. If your pool comes equipped with a diving board, grab the edge of the board as if it were a pull-up bar. Pull yourself up and hold for about 5 seconds before lowering yourself back in the water. Repeat until someone wants to dive. Don’t forget to check out last week’s FBG one-year celebration that was full of fun and GIVEAWAYS! You have until May 29th to enter, so get to commenting. Click here to see all of the special content and giveaways. Want more tips for staying healthy and fit during Memorial Day? Check out the skinny on how many calories you’ll burn during an average Memorial Day holiday. Fun! I like playing in the water.